A portable greenhouse is a great way to go for anyone who’s looking to extend their growing season but doesn’t want to deal with the hassle and expense of a full-scale polycarbonate panel greenhouse. 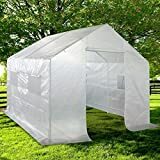 Portable greenhouses generally consist of a lightweight metal frame, with a flexible plastic wrapping that forms the tent. These are held down by tent style stakes and can be moved around pretty easily. After a thorough examination of several portable greenhouses, we have found that the best portable greenhouse is the Ohuhu Walk-in Greenhouse. It’s built with quality in mind and has a great feature set including plenty of shelving for storage. It’s also positioned at a rather attractive price point! For a complete review of the Ohuhu Portable Greenhouse, see our Product Reviews section below. If the Ohuhu Walk-in Greenhouse just doesn’t appeal to you, be sure to check out the Quictent portable greenhouse. The Quictent portable greenhouse is another excellent easy-up, walk-in greenhouse that’s more suitable for those wanting to grow quite a lot. Quictent is known for their pop-up gazebos, and they did a good job making this greenhouse easy to set up. It’s spacious, well-made, and looks great. What more could you want? For anyone who wants to experience growing your garden in a greenhouse, but who needs to stick to a tight budget, the Homewell Mini Walk-In Greenhouse is a great choice. It’s small enough to move around easily, yet large enough to grow a decent amount of crops this summer. The Homewell is well-made and functions as expected. And best of all, it’s cheap! In this section we will look at five of our favorite walk in portable greenhouses, and compare them. We’ll consider the positives and negatives of each, and pick our favorite. If these are all a bit too big for your budget, be sure to consider a mini-greenhouse! The majority of these greenhouses will keep your plants warm during the day but will cool off during the night. For supplemental heat, consider a greenhouse heater or even a 100-watt bulb left on inside the greenhouse. Once you’ve got your greenhouse set up, you’ll definitely want to implement a garden irrigation system. These systems make watering your greenhouse plants a breeze! The Outsunny 5′ square portable walk-in greenhouse is a charming addition to the garden and is capable of growing a significant quantity of plants due to its significant shelving quantity. This greenhouse is a great choice for those who need some space and flexibility, but who don’t want to go full out and splurge on an ultra expensive polycarbonate greenhouse. Produce the plants you always wanted this summer using this portable greenhouse on offer from Outsunny. With covering that’s made from PVC and a steel frame that’s been powder coated for extra protection, this greenhouse is pretty durable under normal weather conditions. Just be aware under high winds it’s likely to get damaged. While it may not be great in heavy winds, it is able to withstand both very hot and cold temperatures and will protect your plants happily during these conditions. In terms of functionality, this portable greenhouse has a zipper door for easy access which also provides extra ventilation for your plants. There are 4 integrated shelves built right into the frame of the greenhouse. The sleek design of this portable frame means you can place it pretty much anywhere in your garden, as long as it’s reasonably level. Assembly of this product is nothing too taxing and can be completed in around 45 minutes or so. Essentially you build the frame, which includes the shelving as part of the structure, and then slip the plastic cover over it. One concern with this tent is that there is currently no replacement cover available. For example, if your plastic cover gets damaged or ripped, you’ll need an entire new greenhouse, which is a bummer. The price is good, it’s easy to put up, and it looks the part too. However, if you live somewhere that’s likely to suffer high winds often, you may want to avoid this greenhouse as it’s not the most durable around. The shelves are also quite weak so be careful when placing heavy plants on them, as this could cause damage to the greenhouse. Considering that there’s barely any difference in price between this and the Ohuhu Walk-in Greenhouse, you’re much better off going with the latter. It looks better and will last a whole lot longer. Ohuhu’s large walk-in plant greenhouse is very much reminiscent of the smaller of the Outsunny greenhouses in terms of size and scale, but it has a few features that take it up a notch from the competition. 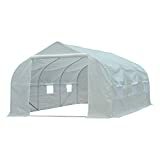 With a large number of shelves for storage, this greenhouse will provide some protection for your plants, and create a solid growing environment. For a high-quality, compact greenhouse that will help get your flowers blooming and your plants sprouting like you’ve never seen before, be sure to check out this model on offer from Ohuhu. It’s lightweight, yet sturdy, and comes equipped with 12 wire shelves in which to store your plants and other equipment. There is a zippered door for easy access, and the frame is wrapped with 0.5mm plastic. The mesh screen at the door opening provides ventilation all around to give your crops and plants the breathing space they need. Set up of this greenhouse is easier than most with literally no tools need at all to put it together. Unlike the Outsunny 5′ greenhouse covered above, the shelves are not part of the frame structure, and they are detachable. If you don’t want shelves in an area, you don’t need them, but you have the option to use them throughout the entire outbuilding. This design makes good sense to us! And it comes equipped with 4 hooks and ropes in which to tie it down, giving it even more stability in windy weather. 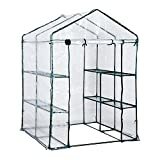 This portable greenhouse is our top choice among portable walk-in greenhouses, due to his simplicity, its shelving quantity, and the overall design. Secondly, it’s equipped with 12 handy shelves that are capable of supporting up to 23.4 pounds in weight, which is ideal for storing your pots, plants, soil, and other accessories. And lastly, the quality is significantly better than many others around. It appears to be much stronger too. So, for all these reasons and more, we’ve decided to make it our number one choice when it comes to portable greenhouses. The one area we have a bit of concern is with the zipper — just be gentle with it! The Homewell Mini Walk In Greenhouse is a step down from the others on our list in terms of size, but though its overall footprint is small, it still can hold a decent number of plants, and it is, in fact, a walk-in design. With three shelves on each side, this greenhouse is a little bit larger than half of the size of the Ohuhu greenhouse covered above. If you don’t need a huge building, but just want a decent shelter at the beginning and end of the season, the Homewell mini may be a great choice for you. If you’re in need of greenhouse but are faced with limited space or funds, the Homewell Mini Walk-In Greenhouse may an ideal choice for you. It’s especially good for early season use. Don’t let the fact that this greenhouse is so lightweight put you off, as it’s more sturdy than you think. Each shelf has a weight capacity of 75 pounds, which is a lot stronger than many other models out there. And being fairly small and lightweight makes it perfect for transporting around. It may be small, but with the integrated shelves, there’s still plenty of room to grow a collection of plants and store a range of accessories. The shelves are optional and can be pulled out if you don’t need them or if they’re in the way, but in general, they are a big help. There’s no other ventilation in this greenhouse except for the door, though the door is adequate. You can place more delicate plants on the ground, out of as much direct light and heat as the upper tiers, and work your way up in terms of hardiness that way. Keep an eye on temperatures in the mid-season, as they can shoot up rapidly in this greenhouse! Assembly of this greenhouse is very simple. No tools are required and it can be done in a matter of minutes. For a portable greenhouse that’s lightweight, functional, and well priced, the Homewell Mini Walk-In Greenhouse is an ideal solution. It may not be quite as top quality as the Ohuhu Walk-in Greenhouse, but for the price you’re paying for this model, it’s not bad at all. There’s adequate shelving on each side, and it has a roll-up zipper door for easy access. The quality is pretty decent and stands up to most others out there. The only real downside in comparison to the Ohuhu Walk-in Greenhouse is that’s it’s a little on the small side. But if you’re looking for a compact greenhouse at an excellent price that won’t let you down in a hurry, this could be it. If you’re in need of a larger portable greenhouse, the Outsunny 11′ x 10′ walk-in greenhouse is a substantial outbuilding capable of fostering a significant number of plants! Six helpful transparent windows, three on each side, will let natural light stream through your greenhouse, and the PVC mesh material will provide protection to your plants even in nasty weather! If size is what you’re after, then this portable, walk-in greenhouse on offer from Outsunny is certainly worth a look. At nearly 12 ft long, this greenhouse has more than enough space to grow a good number of crops this summer. Built using a sturdy powder coated steel frame, and protected with a UV-rated heavy-duty PE cloth, this greenhouse is extremely durable. The zippered door enables easy access to the interior, and the six clear windows give light entry into the interior of the structure. For added stability, this greenhouse comes with 4 guy ropes and 4 ground stakes too. However, significant wind is a big concern with the Outsunny walk-in greenhouse. Assembly of this Outsunny portable greenhouse is pretty simple and all the tools you need to put it together are included in the box. In terms of size, you can’t grumble at this greenhouse. But, in terms of practicality and quality, it is lacking a little, especially considering the price. The first concern that needs pointing out is, unlike the Ohuhu Walk-in Greenhouse, there are no shelves for you to put your plants. This is fine for some kinds of crops but doesn’t really make the most out of all that space. The second thing that lets it down is that’s it’s very lightweight, and even tying it down with stakes may not be enough to be able to withstand strong winds. The frame is on the weak side, and even mild wind gusts can cause significant damage. If you’re in a windy area, consider some of the other options. So, if floor space is what you’re after and you live in a relatively wind-free area, this greenhouse will probably be just fine. Otherwise, you may want to avoid it. Quictent’s entry into the portable greenhouse market is a solid one and is an excellent choice for many. This fairly large walk-in greenhouse is about 10′ square. It has multiple vents around the perimeter that can be opened to allow natural light and air flow through the interior. Another of the larger variety of greenhouses on offer, the Quictent 2 door portable greenhouse is ideal for anyone that’s looking for space. It’s fully waterproof and is quite well designed. The heavy-duty canopy is made using reinforced 140g transparent polyethylene, meaning it will take some force to damage this greenhouse. And if the canopy fails for some reason, you can order a replacement from the company without having to buy a whole new frame and greenhouse! Email [email protected] and you can request a replacement. With two metal-zippered access doors and five exhaust vents fitted in this greenhouse, you can be sure your plants will have more than enough ventilation to keep them growing strong. The ventilation will also help with stability, as well. For additional support, there are 12 stakes included in the package. These will help keep the greenhouse well grounded in even fairly pronounced winds. For a greenhouse that’s large enough to grow plenty of crops, yet lightweight enough to move around as needed, be sure to check this greenhouse on offer from Quictent. It looks good, the quality is great, and despite its size, it’s easy to set up. However, the thing that lets this greenhouse down in comparison to the Ohuhu Walk-in Greenhouse is there are no shelves with this model. You’ll need to provide your own shelving, such as this Keter free standing shelf system. Other than that it’s a great greenhouse and is definitely worth considering. Hopefully, by now you will have a much clearer idea as to which portable greenhouse will best meet your needs. Just remember, for a compact yet top quality portable greenhouse, the Ohuhu Walk-in Greenhouse is the way to go. But, if you want something a little bigger but just as good in quality, be sure to check out the Quictent portable greenhouse. It too oozes style and quality, it’s just a little pricer. Or, for anyone that’s looking to save some money, we recommend taking a look at the Homewell Mini Walk-In Greenhouse. It too is functional and looks good, but this one won’t cost you a fortune to buy outright.